Since childhood, a young woman, Ascagne (Lynn R. Guerra), has disguised herself as a boy and now a young man in order to claim an inheritance that would otherwise go to the household of the young Valère (Will Jobs), who Ascagne happens to love. Valère is a suitor to Ascagne’s beautiful sister, Lucile (Erin Eva Butcher), who loves the young man Éraste (William Schuller). Ascagne marries Valère in a secret midnight ceremony, but Valère believes his veiled and unseen bride to be Lucile, not the disguised Ascagne, which prompts Valère ’s buffoonish manservant Mascarille to relay this misinformation to Éraste, who then believes that his love Lucile has been unfaithful to him and no longer loves him. This misunderstanding leads to a jealous feud and quarrel (I see what you did there, Molière) between Éraste and Lucile which is paralleled with mocking similarities by the quarrels of Éraste’s valet, Gros-René (Amy Meyer, in a pants role), and Lucile’s maid, Marinette (Beth Pearson). Follow all of that? Good because I need a nap. Wilbur’s translation is just not good. He reduces Molière to a mix of Dr. Seuss rhymes and lengthy monologues which present enough lovers’ arguments to foil even the most hopeful of relationships. Luckily, Woods is at the helm and recognizes the script’s deficiencies. However, his corrections may not be the best solutions. 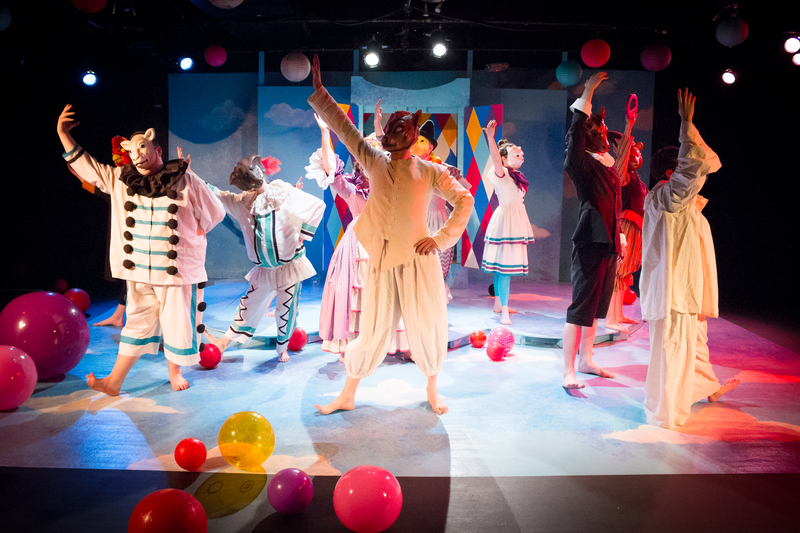 The play opens with an excitement of activity; like a toy chest bursting at its hinges, the production explodes with balls and balloons, colors and lights. The players join the mayhem for a dance, which is expertly choreographed to tell us a bit about each of the characters through their walks, interactions, and glances. Subtly, we know each of their stories before they say a word (though you’ll be confused later once the dizzying madness of Molière’s script presents itself). The masked revels and physicality continue throughout the production, offering the actors a plethora of opportunities to show their most exuberant selves. A stark departure from the relatively stagnant French comedies (the fops aside), all of the character are free to let their bodies loose in a stumbling array of jumps and flourishes. It’s quite magical to watch actors who are comfortable in their bodies and even more exciting to see the endless possibilities to visually present Molière’s text. Woods knows that the text is lacking and cumbersome and wordy and exhausting, and he seeks to alleviate this potential problem with movement and physicality. However, in his cast’s noble attempts to lose themselves in the full force of the scenes, they lose the beauty, subtlety, and nuance of the language. Some extra attention to the language could have made the dialogue and characters easier to follow. While the movement was entertaining, I always felt like I was missing something, captivated by the somersaults of language and the literal somersaults onstage. Perhaps I was in sensory overload. The cast, overall, is entertaining and delightful to watch and follow through the maze of activity and quarrels. However, they offer a mixed bag of talent and skills, especially with Woods’ selected style for the piece and Molière’s inherent linguistic difficulties. Amy Meyer presents a delightfully foppish Gros-René, a wonderful role which should now always be a pants role; she shows wonderful restraint in the comedy and heartfelt sincerity in the emotional rollercoaster of the jealous lover. Lynn R. Guerra’s Ascagne perfects the physical probably best of all within the cast, showing that beneath the male exterior is an energetic and enthusiastic young woman waiting to play. The language is perfected by Beth Pearson’s Marinette, simply a delight to hear her relish the quarrel with Meyer’s Gros-René, and Anneke Reich’s sincere but exuberant Frozine I Zanni. These two actresses show excessive promise as both young ingénues and comedic supporting characters, especially with their command of classical text. Other actors failed to accomplish either the physical or the language, perhaps bombarded by the competing styles that demanded their attention. Erin Eva Butcher’s Lucile is paradoxically both stiff and silly, waiting into late into Act II, during her quarrel with William Schuller’s Éraste to burst into the theatrical and offer the much-needed melodrama of the humorous romantic leading lady of Molière’s comedy. Similarly, Cameron M. Cronin’s Mascarille has some moments of good physical comedy, but overall repeats many of the same movements, intentions, and moments. Likewise, Will Jobs’ Valère never quite reaches the level of his scene partners. He lapses into mere caricature acting at times, and seems unclear on whether he is playing a romantic hero or a villain, often resorting to the later. I’ll claim ignorance in the text, but I think it’s a disservice to the role to play him as anything but sincere and hopeful; I think the villain in the play is the hopeless misunderstandings and the unintended deceptions which go unresolved until the final moments of the play. The set and lighting were simply and beautiful crafted and designed by Woods and assisted by Benson, and Kevin Semagin and assisted by Doron Bloomfield, respectively. They present the action as if dancing and twirling on a cloud, a wonderful merry-go-round of color, featuring soft whites and blues. You felt like you were sitting on cotton candy and hoping the ride never ended. The costumes, designed by Cotton Talbot-Minkin and assisted by Erica Desautels, were worth the price of admission alone with careful attention paid to class, character, and body, accenting each actor and character perfectly to tell an intricate story of him or her. They tied everything together with a neat satin ribbon with the lights, set, and costumes creating beautiful pictures for the story to unfold. And then you had the sound design. You know when you eat too much cotton candy, and you’re about to reach for another handful, and you think, hm, maybe I should stop? That’s how the sound design felt. With constant background noise, which started to sound more like white noise, the soundtrack for the play was overpowering and distracting. As if to blot out Molière’s language, the music played on and on, creating no distinction between scene changes and the players’ dialogue. Lost were the movements of silence because a constant underscoring accompanied the production, as if someone had forgotten to switch off the merry-go-round. I strained to hear key pieces of dialogue and I yearned to kick the juke box until it hurt. Lovers’ Quarrels was an ambitious piece for imaginary beasts, who accept all challenges and succeed on many, if not all, of them. Here, however, it felt like Molière had the last laugh, keeping his piece just a tad too chaotic, a tad too dizzying to go down smoothly. With a dynamic assortment of characters, few of them “supporting,” as much as richly drawn with their own stories to tell, Lovers’ Quarrels offered a maddening degree of entertainment. While many elements appealed to the senses and the story and movement are a delight to watch, I couldn’t help but feel like I just wanted to slow the merry-go-round down. The cast has an exuberant amount of energy, appreciated, yes, but nonetheless exhausting for such a dizzying piece. With the proper spirit and the desire to enjoy one’s self, you can’t fight the urge to laugh and delight in the imaginary beasts’ Lovers’ Quarrels, playing now through April 19, 2014, at the Boston Center for the Arts. For more information, please visit their website. Guest Review: "The Merchant of Venice"